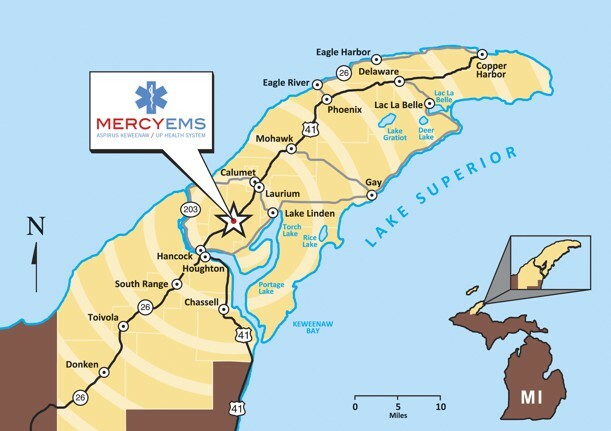 Mercy EMS provides Advance Life Support (ALS) service to all of Keweenaw County and all of Houghton County, except for the townships of Duncan and Laird. Our service area is 1,250 square miles with a population of approximately 38,000 people. We utilize full and part time staff consisting of Emergency Medical Technicians, Advanced EMTs, and Paramedics. Our home station is located at 23298 Airpark Blvd. in Calumet which is located by the airport. Four ambulances are housed at our main facility. Three additional ambulances are stationed in Laurium, South Range and one stationed in Copper Harbor.